At least 25 people were wounded. The wedding party on Wednesday evening was for a family who had been displaced from Iraq's western Anbar province and is affiliated with a major anti-IS tribe there, AP reported. The jihadists captured swathes of northern and central Iraq, including Tikrit, in the summer of 2014, but were forced out of the city by Iraqi forces in April 2015. But they continue to launch attacks in and around the city, which was the hometown of former Iraqi President Saddam Hussein. 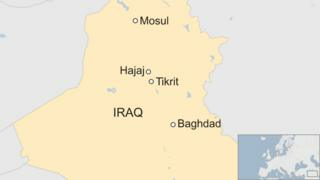 It comes as Iraqi government forces are battling to retake the northern city of Mosul from the Sunni extremist group. After gaining control of the city's eastern side in January, troops are now pushing into the more densely-populated west. This week they have taken a government complex and the Badoush prison, where IS are alleged to have killed 600 mainly Shia inmates.